When things are static, stuck, not feeling or looking like “you”… you may be due for a little home upgrade. True: you may be due for a big upgrade, but if you are not quite ready to make the plunge into a big redecorating situation for whatever reason, small upgrades can do huge things for any space. 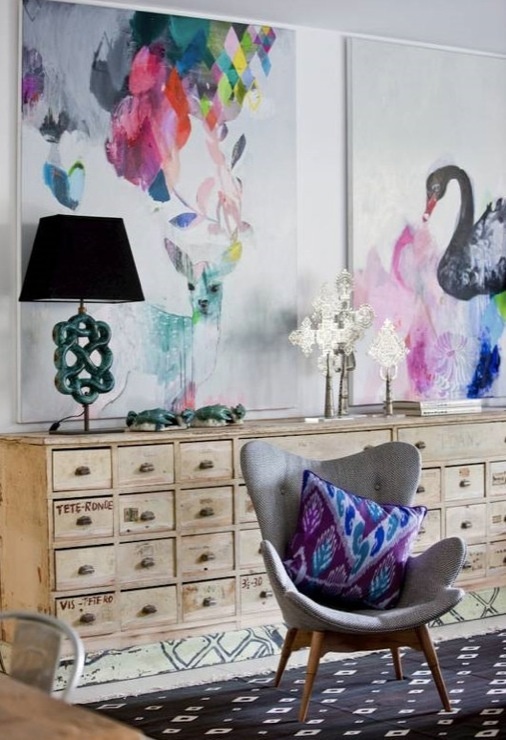 Above, you can see the dramatic “repainted” effect a wall gets when you add some great art. You can make the art. You can find it at thrift stores. You can collect artists you love. But just adding this art is a huge upgrade that isn’t a major headache to accomplish. But… even the fabulous ikat pillow is a big upgrade that is small. Here are a few more easy but major upgrades you might find make a world of difference in your home! Some great hand towels and a few clipped blooms from your neighborhood take the ordinary white-on-white bathroom to a new place that is textures and personal and alive. Is your bathroom engaging? Can you make a small upgrade here to create a better space? THIS video will show you how to make upgrades that can turn your bathroom into a spa-like space, no matter what your budget, space or time constraints may be! 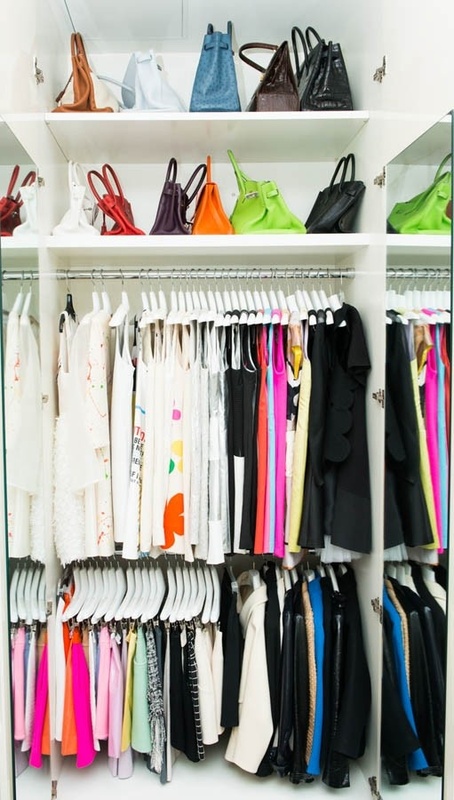 You may not need a new wardrobe, but it may be time to turn over your wardrobe to the next season and organize your closet so that you can actually see what you own! I have complained that I have nothing to wear, only to find after re-doing my closet that I have so much that was just completely out of reach, wrinkled or in storage. A little time taking inventory and re-ordering your closet can renovate your style. And you know, a fresh look for a fuddy-duddy piece of furniture can be had with a bit of paint and not a whole lot of drama. HERE is a whole group of inspiring spray paint projects to get you thinking “simple upgrade” of color, texture and shine for whatever is already in your space. Those photos you love that are in ugly frames can have new life with a little paint on these frames. Same with a mirror, or even a piece of furniture. HERE you’ll find some dresser makeovers that may inspire a bigger change. Let me not forget to mention, an upgrade in your life can be as simple as drinking a new tea, deciding to sleep more, taking a morning walk or thinking better thoughts for even five or ten minutes right now. So, there’s never a barrier to life a little bit better! I’m so happy to hear about your book. Can’t wait to read it. Congratulations!!! And this post was great, it makes me want to go home right now and start cleaning and decorating! I love the art that you find. You find such color and passion. Its kind of shocking what a difference those towels make in the bathroom. I’ll have to check out your other article for more tips on sprucing up the bathroom! 😉 I always love haering from you Marcy! 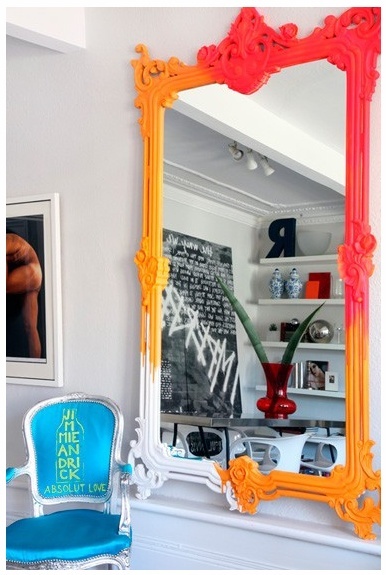 That Mirror is FANTASTIC! I am going to do that around my chalkboard. 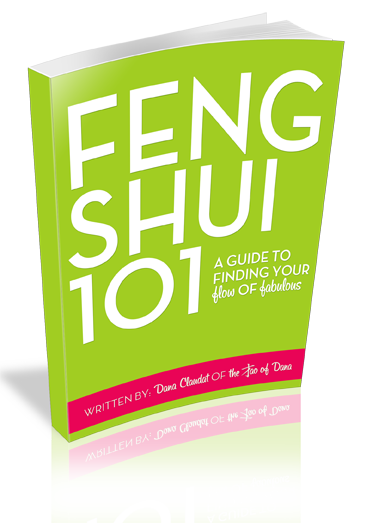 and today is my cleaning.. feng shuing day.. so YAY! I love the art in the first image! Who is the artist?